Manchester School has a new classroom thanks to the hard work of some creative fifth graders. The classroom is not your typical classroom with lights, desks and chairs. Instead, it is outside and offers a new opportunity for learning as an outdoor classroom. range from collecting hats, coats and mittens for members of the community to collecting money for local nonprofit organizations, as well as collecting money for school-based projects such as field trips. This year the students in Mrs. Taudvin’s fifth grade classroom did a little thinking outside the box for their community project. They made a change to their school that offers many positive benefits for many students and will continue to do so for years to come. The students’ first task was to do research. Mrs. Taudvin tasked the students to determine the pros and cons of outdoor classrooms; to see if it was really something from which their school and the students would benefit. After doing the research the kids determined that it was a beneficial project. Their main reasoning: anoutdoor classroom would be a cooler learning environment where the schools are not air conditioned. It would also save on energy costs, because while students are outside the lights would not be in use in the classroom. The students had no budget, but that was not going to stop them because their minds and hearts were set on completing this project. Once the perfect location was found for the classroom, the next step was to reach out to their school’s principal and the school property director to obtain permission for this project. The students received permission and they were soon off brainstorming different setup plans for the outdoor classroom. As part of the plans, the students needed about 30 tree stumps to function as chairs for the students. 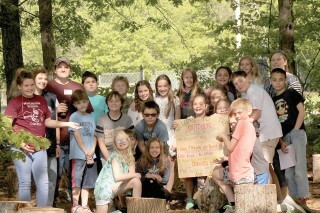 To the students’ surprise, they received a generous donation from Barry and Amy Strout who donated not only the stumps, but also a large stump that could be used as a table. The students created brochures to distribute to the teachers and staff and created a signup sheet to prevent double booking of the outdoor classroom. The students even put together a PowerPoint presentation to educate teachers and students about the outdoor classroom. A ribbon cutting ceremony was held at the end of May to celebrate their achievements. Danielle Donnini, Manchester Principal, Kristal Vargo-Ward, Manchester Assistant Principal, and three other Manchester School classrooms were in attendance to help commemorate and support the event and the students. Soon there will be a professional sign in place, marking the outdoor classroom, along with a set of rules to make sure the area stays fit for everyone to use. Over the first week of the outdoor classroom existence, the classroom has been used several times by different classes to take advantage of the beautiful weather and the benefits of learning outside. The Friday after the ribbon cutting ceremony Mrs. Taudvin asked her class to write a reflection page in their journal about the process of creating the new classroom. Mrs. Taudvin stated that the kids’ reflections of their hard work were moving. The students were so proud of what they had accomplished together as a team to improve their community. Those interested in making any donations should contact Manchester School directly.